The RMD Foundation is committed to working with community residents and organizations to make measurable, sustainable improvement in the health status of underserved population. 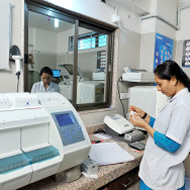 Manikchand Group has set up modern hospitals, where treatment is administered at highly subsidized rates, and, in many cases, completely free of cost. Over and above we also conduct regular medical camps in rural areas. The Matoshree Madanbai Dhariwal Hospital is a shining example of RMD's firm belief in providing world-class healthcare. It is equipped with a 24 hour ICU, operation theatres, ventilators, defibrillators, image intensifiers, laboratory analyzers, color doppler, UGS machine, post-operative facilities etc.